In this guide I explain how to disassemble a Toshiba Satellite C875 laptops. Also, you should be able to use this guide for taking apart a Toshiba Satellite C850 C855 C870 C875 series laptops. 1. 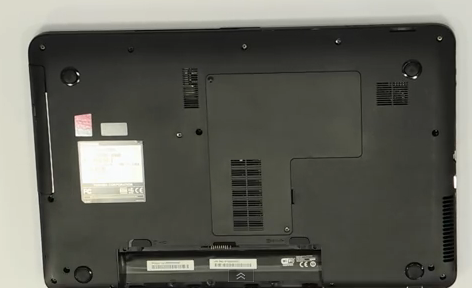 Before you start, make sure the laptop Toshiba Satellite C875 is turned off and battery removed. 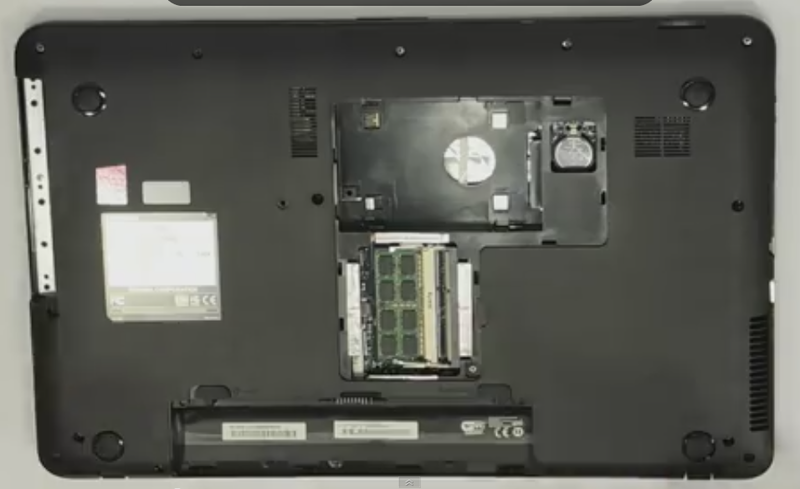 Remove one screw securing the memory/hard drive cover on the bottom of the laptop..
2. 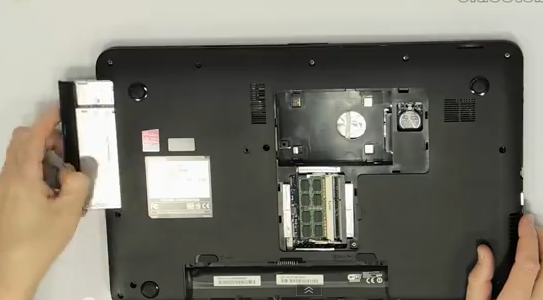 Lift up the cover and remove it from the laptop.Slide the hard drive to the right in order to disconnect it from the motherboard. After that lift up and remove the hard drive from the laptop. 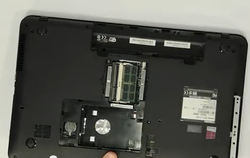 3.Remove one screw securing the DVD drive.Pull the DVD drive to the right and remove it from the laptop. 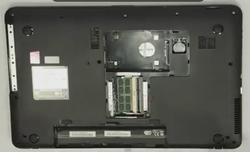 4.You'll find a small hole in the hard drive compartment.Insert a small screwdriver into the hole and push the keyboard bezel away from the laptop. 5. 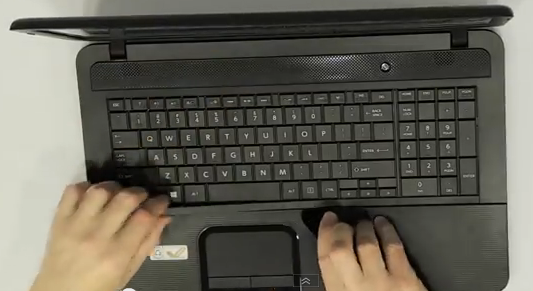 The keyboard bezel will separate from the laptop a little bit. Continue removing the bezel with your fingers. I'm using the guitar pick to lift up and separate the bezel. 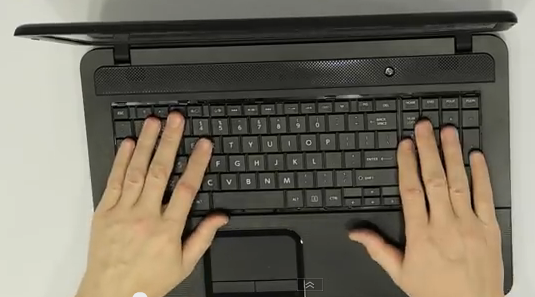 6.Remove the keyboard from the laptop and place it upside down on the palmrest.Be careful. The keyboard still attached to the motherboard. 7. In order to unlock the keyboard cable connector lift up the brown retainer with your fingernail or tweezers.The retainer will open up at a 90 degree angle. 8. 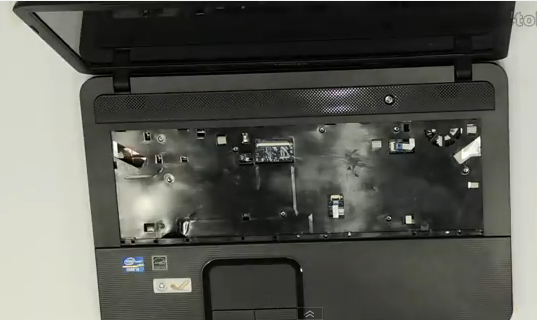 Remove all screws from the bottom of the laptop..
9. Remove all screws securing the top cover assembly. 10. Start separating the top cover from the bottom cover.NOTE: In Toshiba Satellite C875 C875D C870 C870D laptops the motherboard is attached to the top cover. 12. Loosen the screws securing the heatsink and fan, and disconnect the cooling cable. 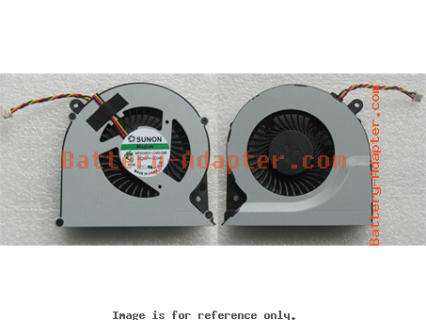 Then you can remove the Toshiba Satellite C850 C855 C870 C875 fan assembly. 13. Remove the fan assembly. 14. 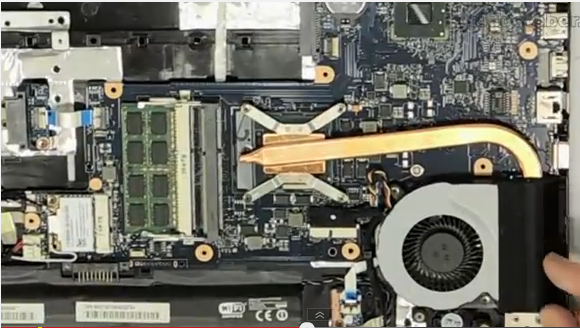 Normally, the heatsink doesn't need to be replaced. 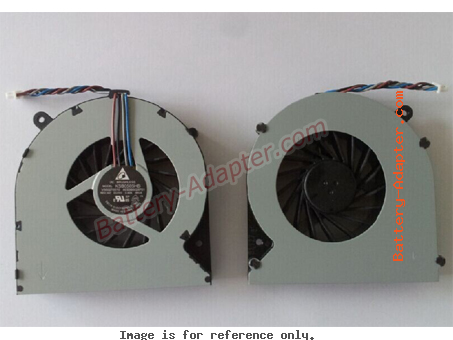 You can unscrew the four screws on the fan cover and take part the fan from the heatsink. 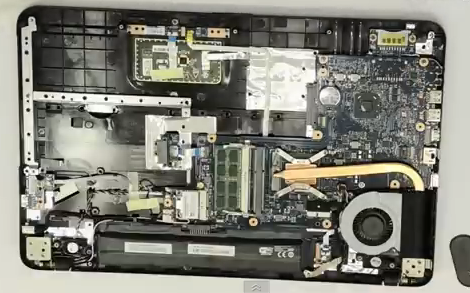 Reverse the procedure to assembly your Toshiba Satellite C850 C855 C870 C875. Please don't forgot to add new thermal grease before you install the heatsink.